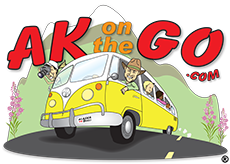 When Monte Davis of the Homer Chamber of Commerce first asked if AKontheGO would consider listing the entire community as a “Family Friendly Business”, I’ll admit I was a bit taken aback. Could one town really meet the standards of AKontheGO-ness, offering kid-friendly activities, food, lodging, and atmosphere, everywhere? Hmmm, I said. I’ll call you back. And here I am. 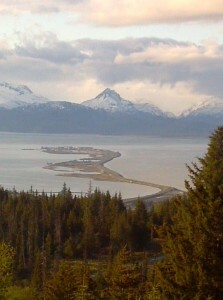 Consistent readers of AKontheGO already know how much AK Fam adores Homer, a town of about 7,000 people at the end of the Sterling Highway on the Kenai Peninsula. It’s flush with everything an Alaska family could want in a vacation spot – ocean, beach, trails, and an environment of pure relaxation. Homer manages to capture our recreational desires and soothe our frazzled nerves (yes, dear readers, AK Fam becomes frazzled, too) without fluff or fuss, and we like it that way. Turns out, so do a lot of other people. What is the root of Homer’s charm? Families, folks, and a dedication to the same. It’s this simple approach that creates a win-win for moms and dads who visit with their children, and it’s evident just about everywhere. Find Homer by driving 225 scenic miles from Anchorage, along the Seward Highwy, then connecting to the Sterling Highway, all the way to the proverbial “end of the road”. 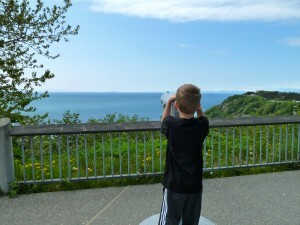 Allow five hours in the car with kids; there’s lots to see, do, and experience the entire trip. Flying to Homer is expensive, but can be done quickly and easily with regional airlines like Era Alaska and Grant Aviation. Allow 30 minutes for the flight from Anchorage, but do remember that weather can play a part in on-time departures or arrivals. 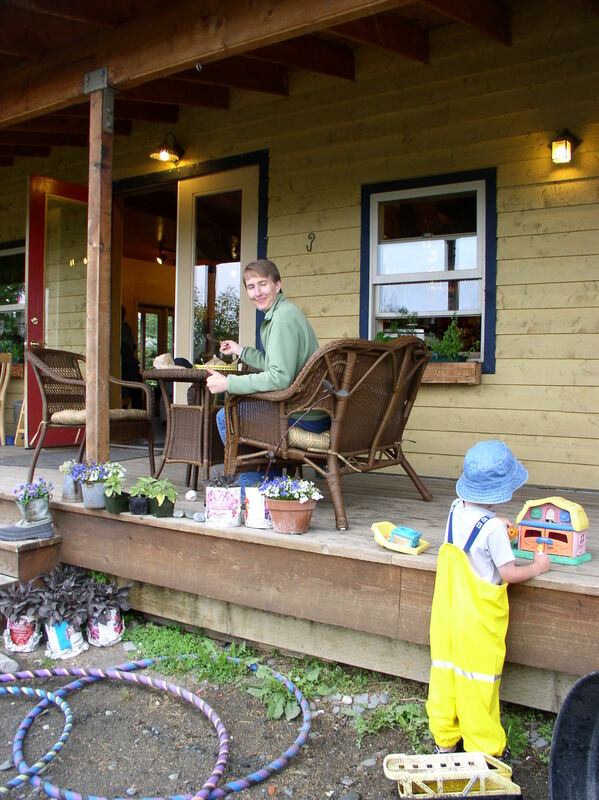 Charming, kid-friendly accommodations at Homer Seaside Cottages. 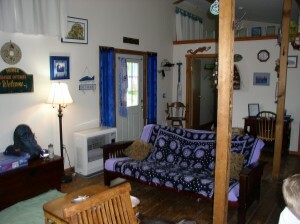 Lodging is more fun in Homer, with a plethora of low-key options available. 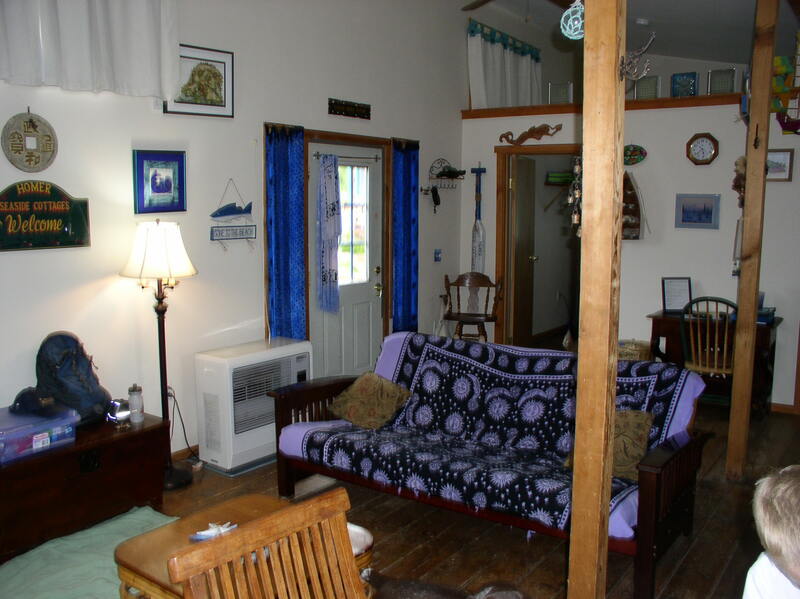 We like to stay at the Homer Seaside Cottages, a trio of small, teal and purple cabins smack in the middle of Old Town, and right next to kid-friendly Bishop’s Beach. AK Kid thrives at this location, and we do, too. Here’s the basic a.m. routine: Wake up, walk down the block to Two Sisters Bakery, eat ourselves silly with sticky buns and fabulous coffee; amble to Bishop’s Beach for a morning stroll; return to cabin and plan the rest of our day (hiking, fishing, or maybe even a nap?!). Wash, rinse, repeat. It’s that easy. Now THIS is a playground! Activities are abundant and geared toward kids from birth to 18. 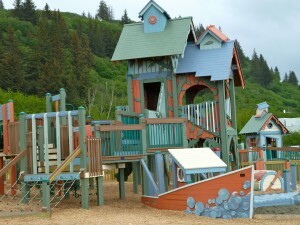 Visit the brand new community playground and savor the equipment and the view. 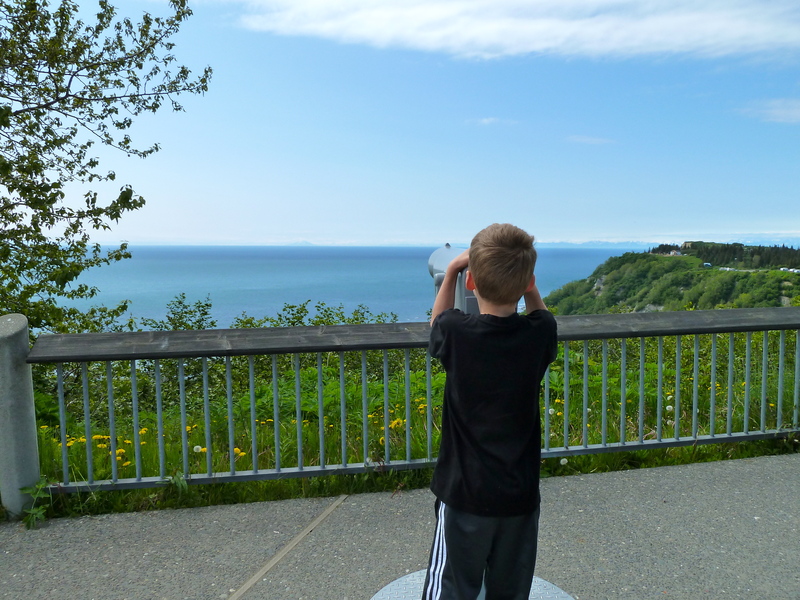 Check out the wonderfully appointed Islands and Ocean Visitor Center, where science meets history with a gentle approach that allows for hands-on exploration and learning. Stop by the Center for Alaskan Coastal Studies and discover programs at their beachside classroom yurt, or at their forested Wynn Nature Center, spending an entire day immersed in the wild wonders of Homer. Take a boat ride across Kachemak Bay to the center’s Peterson Bay Field Station, or paddle a kayak and share the water with a sea otter. The Homer Chamber offers tons of additional information at their visitor center, located along the Sterling Highway. Find directions HERE. Enjoy a sticky bun and some coffee on the Two Sisters deck while kiddos play. Awesomeness. Feeding kids is no problem, either. I’ve already mentioned the beautiful Two Sisters Bakery, where outdoor play space and yummy breakfast, lunch, and dinner are readily available, and where children are more than welcome. We also enjoy a good fish and chip meal at Captain Patties Fish House (907-235-5135) on the Homer Spit, where prices may be a bit high (go for lunch or split a dinner entree’), but the fish is fabulous, and service always wonderful. Kids can order non-fish items, too, by the way. Fresh Sourdough Express is another family winner, having served Homer families for close to 30 years. Their sandbox outside the main entrance is a testament to their commitment to kids, and their menu reflects a growing trend for fresh, local foods at reasonable prices. Head there for breakfast, lunch, or dinner with a smile. I love Homer. Settle in and stay awhile, why dontcha? Posted in Alaska Road Trips, Big Kid, Kenai Peninsula, Little Kid and tagged Alaska, Alaska Travel, Family Travel, Homer.